Wall art is very popular and admired by art lovers. Walls are decorated by different means, one of which includes displaying of plates on walls. This type of art helps in giving the place an elegant touch. It grabs attention and enhances the look of the room. 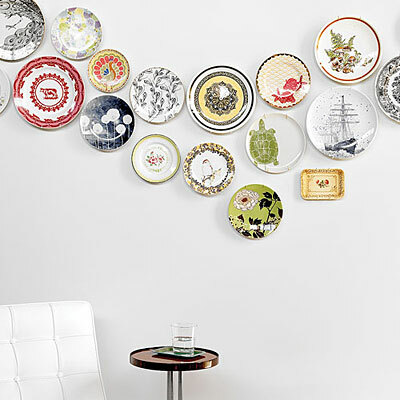 Once you know the correct way of arranging plates on your wall, you’ll be surprised by the outcome. There are literally hundreds of ways in which you can align the plates. Below are some beneficial tips that can assist you in decorating your room with something just as simple as plates. First of all gather your collection of plates. If you already have a decent collection of plates then you will have to organise them properly according to the way that you want to group them for hanging. However, if you do not have a plate collection then you will have to acquire some. You can do so by looking around for other people that might be selling off their collections or check online sources for some plate collections. For hanging them you’ll need some stretchable bands. You can also use plate hangers as holders. Attach these hangers or bands to your plates beforehand and put them aside to dry. Now select the wall that you want your art is to be displayed on. It has to be a clear clean wall which is devoid of any artwork. Painting your wall with a single colour will also be a good idea, provided the colour is matched according to the one on your plates. Keep in mind that your background should become a source of enhancing your plates and not overshadowing them, so use appropriate colours. You will have to do some research to understand how to colour coordinate for your plate collection. The wall that you paint should be of a colour that not only enhances your plate collection but also provides the perfect backdrop or base. The colour of your plates could also match something in your room. It can be your carpet, furniture or curtains. It is a proper interior design concept which you will have to follow in order to make our plate collection look elegant and unique at the same time. If you have any issue then you can always go online for some tips and tricks to help you out with the colour coordinating. As for the pattern, arrange your plates in different shapes as trial work. Try circle, diamond, horizontal, shooting star shape or simply create your own. Be sure to follow a particular pattern that suits your home or apartment. Remember you do not want to create something that is confusing or looks out of sorts on the wall. Everything should aesthetically pleasing. Now mark the chosen places with pencil and place nails. Put your plates on the nails and give your work a final look. Make adjustments if needed. Make sure that the plates are secure so that they do not fall and break.